– 06:30 Hrs: Arrive Udaipur airport. – Upon arrival at Udaipur airport welcome, meet and assist by our representative and transfer to hotel. – After breakfast you will enjoy city tour visiting City Palace, Jagdish Temple, Saheliyon Ki Bari and Sajan Niwas Gardens. The city palace was built in 1725 with various palaces inside it such as Dilkush Mahal, the palace of Krishan Moti Mahal, Sheesh Mahal all ornately decorated. The museum in City Palace contains incomparable historic and artistic heritage which dates back to 14 century. The Garden of the Maids of Honour, a most serene place in Udaipur, designed by Maharana Fateh Singh. It consists of beautiful lawns, gardens and fountains, a retreat for the ladies of the household, Rana Pratap Smarak. – Afternoon enjoy Boat ride on Lake Pichola. – Day at leisure to explore city of lakes at your own pace and overnight stay at hotel. – After breakfast drive to Jodhpur – founded in 1459, Jodhpur is referred as Sun City for its bright & sunny weather. It is also termed as Blue city for it blue whitewashed houses around Mehrangarh Fort. – En route visit the tranquil pilgrimage town of Ranakpur, renowned for some marvellously carved Jain temples. – Upon arrival at Jodhpur, check in at hotel. It is located atop a 125 m high hill. 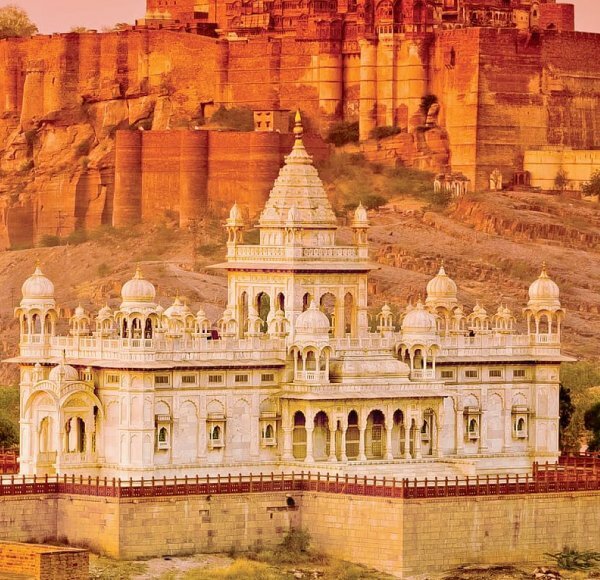 The magnificent Mehrangarh Fort is the most majestic and one of the largest forts in India. The construction of the fort started in 1459. The walls of the fort are up to 36 m high and 21 m wide; they enclose some exquisite structures. The fort museum houses an exquisite collection of palanquins, howdahs, royal cradles, miniatures, musical instruments, costumes and furniture. The rampart of fort not only has excellently preserved cannons but also gives a breathtaking view of the city. Kipling once remarked, the fort seems to have been built by giants and not by ordinary people. It is one of the fascinating palaces of Jodhpur, Maharaja Umaid Singh constructed in the 20th Century. A part of the palace has now been converted into a hotel and a museum. They are wells or ponds in which the water is reached by descending a set of steps. They may be covered and proteted and are oftern of architectural significance. The Stepwell ensures the availability of water during periods of drought. The stepwells had social, cultural and religion significance. 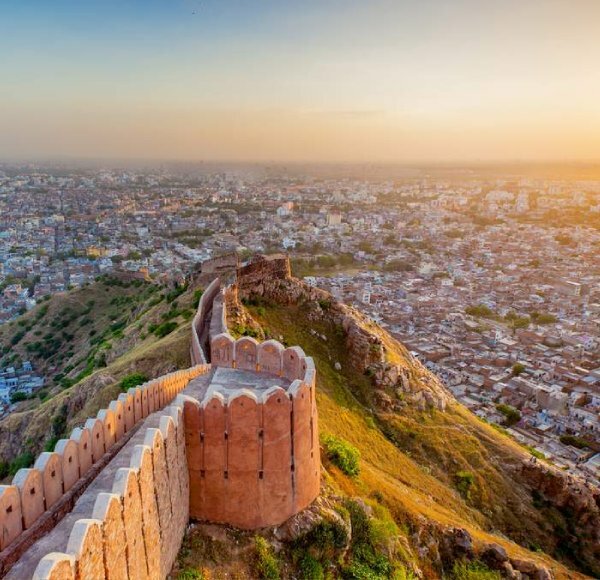 – After breakfast drive to Jaipur – Founded in 1727 by Maharaja Sawai Jai Singh – II, the ruler of Amber, Jaipur was the first planned city in India. 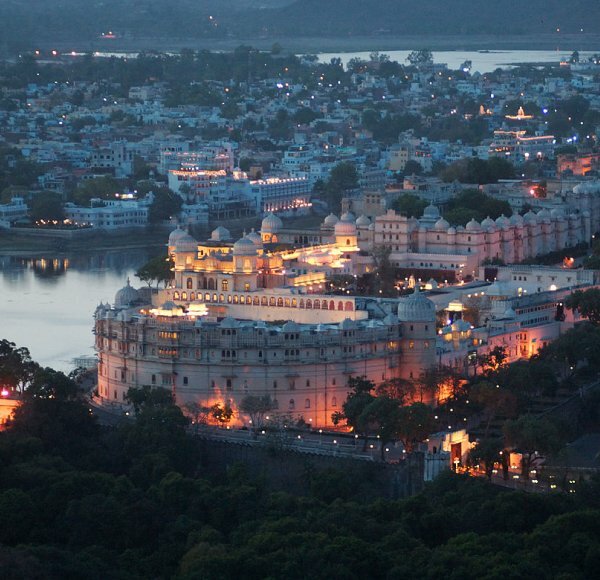 This town is also referred as Pink city for the colour of buildings in its wonderful old city. The city was painted pink to honour the visit of Prince Albert of England in 1882. – Upon arrival at Jaipur, check in at hotel. – This morning excursion to the Amber City Fort. situated 130m high with the Aravalli hills around and 11 km north of Jaipur. It was the ancient capital of the Kachhawaha Rajputs till 1037. Ride the colourfully painted elephants up the hill, admire the massive gateways, courts, stairways, pillared pavilions and palaces the recall the glory and wealth of Amber’s association with the Mughals. – Afternoon enjoy city tour visiting the The Maharajah’s City Palace, Jantar Mantar, Hawa Mahal and Johari Bazaar. 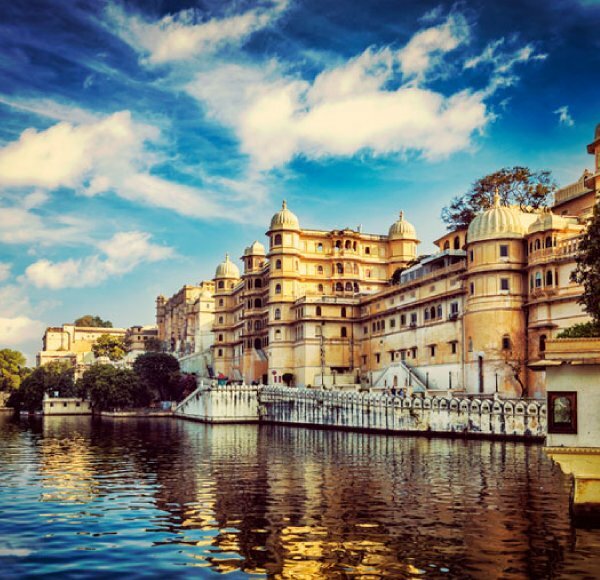 A delightful blend of Mughal and traditional Rajasthani architecture, the City Palace sprawls over one-seventh of the area in the walled city. It houses the Chandra Mahal, Shri Govind Deve Temple and the City Palace Museum. This is the largest and best preserved of the five observatories built by Jai Singh II in different parts of the country. The ornamental facade of this “Palace of Winds” is a landmark in Jaipur. Its five – storey structure of pink sandstone encrusted with fine tellies work and balconies has 953 inches and windows. It was built in 1799 by Pratap Singh and was a royal grandstand for palace women. The main bazaar is in the old city for jewellery and saris.